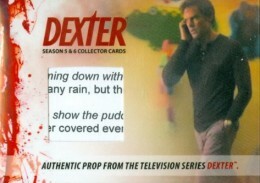 Dexter might be done on TV, but the killer of killers is still getting the trading card treatment. 2015 Breygent Dexter Seasons 5 and 6 brings the show closer to the end, recapping two of the best seasons with a premium-style factory set. Each comes with a full base set, six inserts and two autographs, costume or prop cards. The 2015 Breygent Dexter Seasons 5 and 6 base set has 72 cards. With each season consisting of 12 episodes, that's plenty of room to capture the central stories and themes. 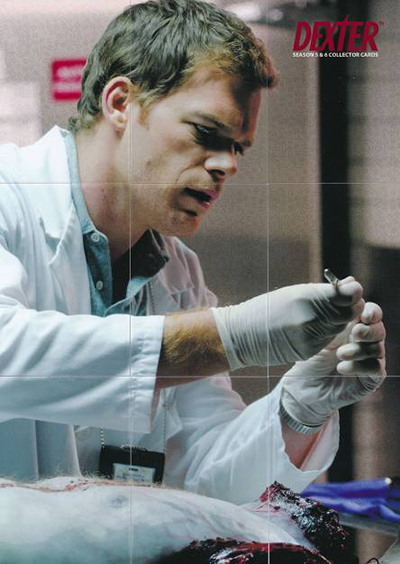 Michael C. Hall, Dexter's titular star is back as an autograph signer. So far, his signature has appeared in all four of Breygent's set for the show. This set has a total of 18 different autograph cards including three dual autographs. 2015 Breygent Dexter Seasons 5 and 6 has the first certified autograph cards of Julia Stiles. The actress has appeared in such films as 10 Things I Hate About You, Save the Last Dance and the original Bourne trilogy. Other signers include Desmond Harrington (Quinn), Aimee Garcia (Jamie) and Maria Doyle Kennedy (Sonya). All Costume cards have at least two swatches. There are eight dual-swatch cards and a pair of triple-swatch cards. 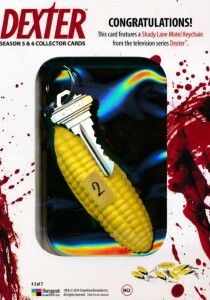 Prop cards use other items from the show. Among them are a pair of Super Prop cards. Too big to fit in boxes, Super Prop cards are inserted as redemptions. 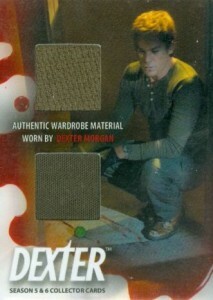 All three of the basic inserts in 2015 Breygent Dexter Seasons 5 and 6 have nine cards: Beyond the Script, Doomsday Killer and Quotes. Each set has two of each insert. ACRYLIC "OPTISPEX" COLLECTIBLE CARD (BREYGENT) DEXTER SEASON 5 & 6 "KILLER DAY"
ACRYLIC "OPTISPEX" COLLECTIBLE CARD (BREYGENT) DEXTER SEASON 5 & 6 "CRUCIFIX"
Cards available with different color ink. 9 cards. Inserted 2 per set. Form a puzzle. 9 cards. Inserted 2 per set. Inserted via redemption due to size and thickness.